Polls are open until Sunday, March 30th, 2014 at 11:59 PM EST. Enjoy! It hurts to vote against Dawn of Sorrow. Otherwise this was relatively painless. 1. Ugh. I don't know what to pick. Both games have their issues. Zelda over Metroid I guess. 2. Still haven't played either. Castlevania. 3. Galaxy still remains overrated. Kill it with fire. 4. Bah. I love Smash Bros. I love Zelda. Why do you do this to me? Sigh. What an uninspiring round. Super Metroid, I GUESS. This game is really wearing on me through time. Maybe I oughtta replay it. Mega Man 2: The Best. Best Music in any game ever? Possibly. Haven't played Galaxy 2 yet, Galaxy 1 is pretty darn good, I'm told they're essentially the same. While Skyward Sword was the best 3D Zelda since the N64, I played the SNOT out of Melee when it came out. EDIT- This whole tourney is still pretty interesting, Jargs. I know it was simple, and "anyone" probably could've thought of it, but you did, and you put it in motion. Good stuff, and the logos make it look superrad, too. Good work, Bigs. Wouldn't mind seeing the next set of games down (9-16, etc.) per each category next year, a "Best of the Rest" sorta thing. Would that be equally as interesting? Would underappreciated games come out of the woodwork? Or would people simply be that unfamiliar with each game that it wouldn't garner either the attention or "evidence" relevant to this? Hmm. The only tough one for me was Skyward Sword versus Melee but I had to go with Melee and its many many hours of fun. Thanks man. 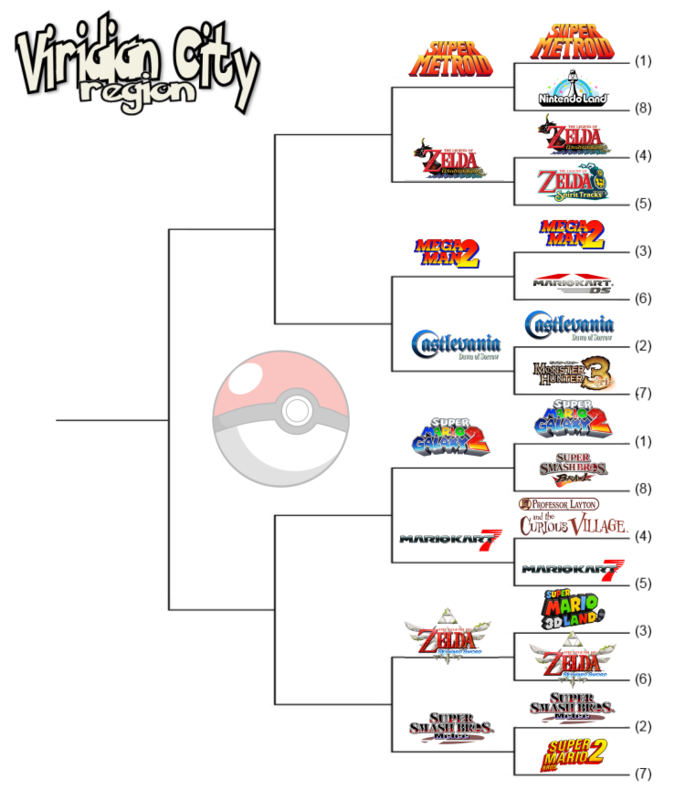 I'm hoping we get at least one non-Mario or Zelda game in the final 4. Come on, Melee! Easy choices for me. Not a fan of Wind Waker, never played Castlevania Dawn of Sorrow, didn't think much of MKVII, and Melee is still my fave game on any platform. A1: Too bad about TWW--it beats every other game on this list for me easily. But Super Metroid will get my pick every time. A2: Easy pick. The nonlinear Castlevanias are pretty sloppy in retrospect. A3: Like DoS, MK7 is out of its league at this point--Galaxy 2 beats it quite handily. A4: As much as I like SS, Melee is very hard to top. Going chalk this round. All of them. Easy picks. These were all very easy choices, for a change! #1 was the hardest yet. Two perfect 10s. But my hearts with Wind Waker. Mario Kart 7 was good, but it's where I started getting bored with the formula. Super Metroid over Wind Waker by a country mile. Galaxy 2 over Mario Kart 7. Both games have kind of fallen in my eyes over the years, but Galaxy 2 is masterful at times. MK7 is basically portable Mario Kart Wii. Melee over Skyward Sword. I liked SS a lot...but come on, it's Melee here.